Presents material at two levels of difficulty: the main text addresses the fundamental concepts and presents a broad view of image processing, whilst more advanced material is interleaved in boxes throughout the text, providing further reference for those who wish to examine each technique in depth. Contains a large number of fully worked out examples. Focuses on an understanding of how image processing methods work in practice. Illustrates complex algorithms on a step-by-step basis, and lists not only the good practices but also identifies the pitfalls in each case. Uses a clear question and answer structure. Includes a CD containing the MATLAB® code of the various examples and algorithms presented in the book. There is also an accompanying website with slides available for download for instructors as a teaching resource. Professor Maria Petrou has been teaching image processing for more than 20 years, within both academic and industry settings. 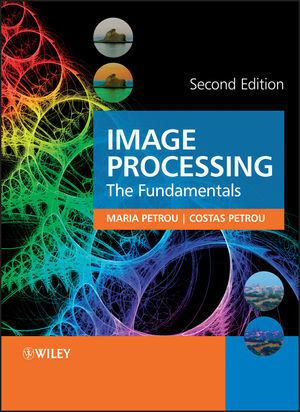 As well as co-authoring the first edition of Image Processing: The Fundamentals (1999), Professor Petrou has also co-authored Imaging Processing: Dealing with Texture (2006), both published by Wiley. She has recently co-edited a book on the human visual system published in July 2008 by Artech House. Professor Petrou has also published more than 10 book chapters. Dr Costas Petrou studied for his PhD in Electrical Engineering at UCL. He now works as an independent software consultant in Thessaloniki, Greece. 2.2 Haar, Walsh and Hadamard transforms. 2.4 The even symmetric discrete cosine transform (EDCT). 2.5 The odd symmetric discrete cosine transform (ODCT). 2.6 The even antisymmetric discrete sine transform (EDST). 2.7 The odd antisymmetric discrete sine transform (ODST). 3 Statistical Description of Images. 4.1 Elements of linear filter theory. 4.2 Reducing high frequency noise. 4.3 Reducing low frequency interference. 5.1 Homogeneous linear image restoration: inverse filtering. 5.2 Homogeneous linear image restoration: Wiener filtering. 5.3 Homogeneous linear image restoration: Constrained matrix inversion. 5.4 Inhomogeneous linear image restoration: the whirl transform. 5.5 Nonlinear image restoration: MAP estimation. 6 Image Segmentation and Edge Detection. 6.3 Phase congruency and the monogenic signal. 7 Image Processing for Multispectral Images. 7.1 Image preprocessing for multispectral images. 7.2 The physics and psychophysics of colour vision. 7.3 Colour image processing in practice.